oneshotbeyond (Homepage) wrote: this is a very unique photograph. Love the feeling it gives me. Filippo (Homepage) wrote: so delicate and strong at the same time! great! i'll come back again! Harry Snowden (Homepage) wrote: Awesome image! Marie (Homepage) wrote: ce rendu est fabuleux !!! Kevin from OrganicPIX.com (Homepage) wrote: Oh, love this. Intriguing minimal approach. Larry Bliss (Homepage) wrote: Reality turns to abstraction. I like! Fantome (Homepage) wrote: The difference of textures between the floor and the trees is quite surprising. I love the result. 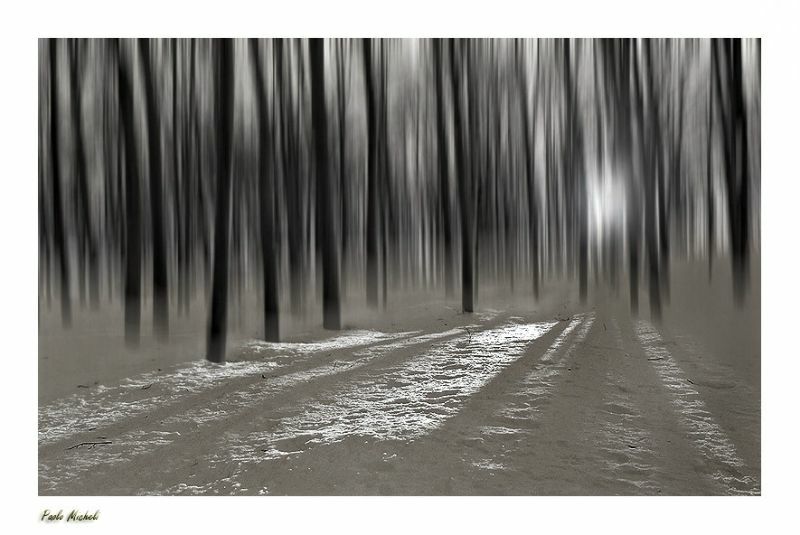 Marcah (Homepage) wrote: Excellent work in b&w, The light behind the forest is amazing. jcof (Homepage) wrote: Maravillosas fotografías con efectos de movimiento y desenfoque. Parecen sueños hechos realidad. Enhorabuena. Wonderful photographs and motion blur effects. Seem dreams come true. Congratulations. Andrew (Homepage) wrote: Walking through a dream. I really like the effect with the trees, so surreal and calming. Nicely contrasted by the clear sharp ground. Excellent. cristina venedict (Homepage) wrote: wonderful! Lunamania (Homepage) wrote: I want to walk towards that light...great processing here and I like the abstract feel. Frida (Homepage) wrote: Beautiful image love the processing here. Laurie (Homepage) wrote: Nice effect. Very graceful. Susan (Homepage) wrote: Amazing image. I love the selective focus and the light...really, just everything about it. Fantastic! Ivar (Homepage) wrote: Cool shot, I like the light and shadow play in the snow... I like the effect on the trees better in this shot too. Very nice. 613photo (Homepage) wrote: Beautiful! It appears you used the same technique in "Loaded Tables". I honestly wasn't too fond of it there but it's very, very good here. Love the shadows and details in the snow, too. micke bergling (Homepage) wrote: The first thing I thought .. I am in a dream .. This photo is beautiful, just love it ..
Tom (Homepage) wrote: Cool effect and focus where needed. Arnd (Homepage) wrote: This is a truly fascinating, artistic and magical image. Great work! beanow (Homepage) wrote: And again the stunning of the image! The splendid processing. Arjan - PlasticDaisy (Homepage) wrote: This is vibrating! Krims@nline.be (Homepage) wrote: Wonderfull capture, superb processing, great details in the snow. Congartulations. Relly superb. Sabine (Homepage) wrote: I really like the light and the abstract feel of it.